The name « puzzone » sparks a smile in every Italian/speaking person. It means stinky in a funny way and refers to the distinctive smell of ammonia of this cheese. It is given by the wild herbs eaten by free range cows in the Dolomites and by a particular process involved in its ageing. The cheeses are periodically washed until their skin becomes waterproof, starting an inner fermentation process. It’s a D.O.P. (designation of protected origin) product and also a Slow Food Praesidium. Its history is related with the tradition of the summer transhumance of the livestock in three valleys of Trentino Alto Adige. In Fassa valley, Fiemme valley and Primiero area, as well as in most of the Alps, farmers bring the herds of cows at a high altitude to spend the summer free range. These mountains are pointed by « malghe », alpine cottages used as breeding station during the warm season. 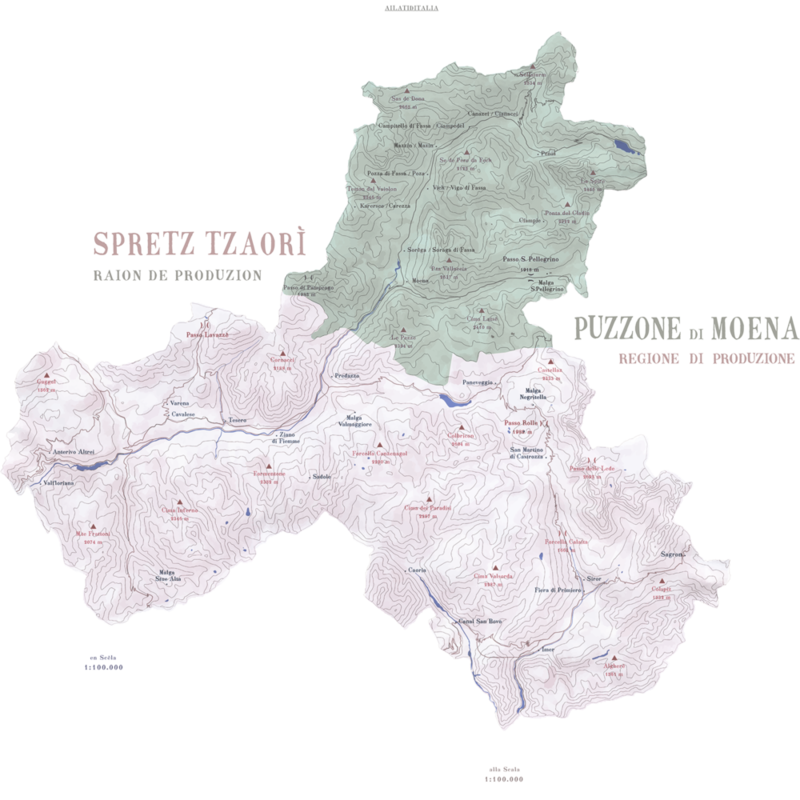 In this autonomous region - inhabited by a mix of Italian and German speaking population plus a minority of Ladin people with their distinctive language - the « malghe » are public properties which concession is granted to local farmers. This public oriented scheme stimulated a cooperative mentality among farmers, which, throughout the decades, organised in different associative forms, have been able to best safeguard their interests. The price payed by local cheese factories for a kilogram of raw milk is actually one of the highest of Italy. In 2017 it reached the 0.60 €/kg against the Italian average of 0.35 €/kg. The milk produced at high altitude, used to make the best « Puzzone », is worth its price. The D.O.P. guidelines strictly lists the mountain herbs that must be present in the diet of the cows. The tradition of the summer transhumance has other positive effects on the territory. Fields, even in the most remote slopes, are periodically mowed to collect the winter stock of straw contributing to the maintenance of the territory. But what’s surprising is that most people involved in this summer works are youngsters. Contrarily to the rest of Italy where breeding is being abandoned by the new generations, the kids of this area are still attracted by this world revolving around the stable. « They see the opportunity of a decent remuneration » says Alberto Bettega, director of the cheese factory in Fiera di Primiero. « A third of our farm owners are born after the 70’s and most of workers are students of the technical school of agriculture in San Michele d’Adige, which organises internships in farms here, in other areas of the region and in Austria ». The « desmontegada » is the festival that celebrate the end of the summer transhumance. The local « malghe » lace their cows as beauty queens and bring them down for a parade in the streets of Moena and other villages. After a summer up in the mountains young workers also wear their best costumes to impress the girls of the village. It’s a celebration of a tradition that faces a bright future.